General Description of Wilm's Tumor 1 (WT1) (Wilm's Tumor & Mesothelial Marker). Recognizes a 47-55kDa-tumor suppressor protein, identified as Wilm's Tumor (WT1) protein. The antibody reacts with all isoforms of the full-length WT1 and also identifies WT1 lacking exon 2-encoded amino acids, frequently found in subsets of sporadic Wilm s tumors. WT1, a sporadic and familial pediatric kidney tumor, is genetically heterogeneous. Wilm s tumor is associated with mutations of WT1, a zinc-finger transcription factor that is essential for the development of the metanephric kidney and the urogenital system. The WT1 gene is normally expressed in fetal kidney and mesothelium, and its expression has been suggested as a marker for Wilm s tumor and mesothelioma. WT1 protein has been identified in proliferative mesothelial cells, malignant mesothelioma, ovarian carcinoma, gonadoblastoma, nephroblastoma, and desmoplastic small round cell tumor. Lung adenocarcinomas rarely stain positive with this antibody. WT1 protein expression in mesothelial cells has become a reliable marker for the diagnosis of mesotheliomas. Anti-Human Wilm's Tumor 1 (WT1) (Wilm's Tumor & Mesothelial Marker) Positive Control Sample: K562 cells. Wilm s Tumor, mesothelioma or fetal kidney. Buffer and Stabilizer: 10mM PBS with 0.05% BSA & 0.05% azide. Also available without BSA & Azide. 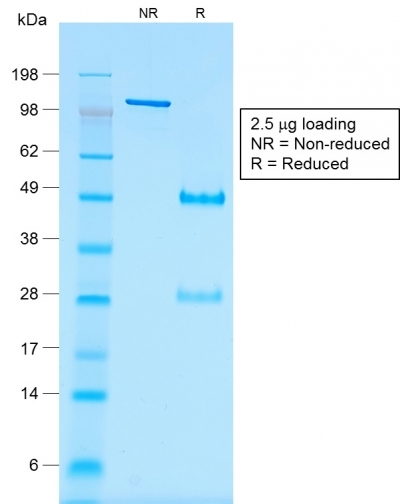 Antibody Purification Method:Protein A/G purified from Bioreactor concentrate. Storage Conditions: Store at 2 to 8 C (refrigerate). Stable for 24 months when properly stored. Anti-WT1 antibody staining is expected to be primarily localized to the nucleoplasm. Variations in Wilm's Tumor 1 antibody staining intensity in immunohistochemistry on tissue sections are present across different anatomical locations. An intense signal was observed in myoepithelial cells in the breast, cells in the endometrial stroma in endometrium, glandular cells in the fallopian tube, cells in the glomeruli in kidney and cells in the seminiferous ducts in testis. More moderate antibody staining intensity was present in myoepithelial cells in the breast, cells in the endometrial stroma in endometrium, glandular cells in the fallopian tube, cells in the glomeruli in kidney and cells in the seminiferous ducts in testis. Low, but measureable presence of Wilm's Tumor 1 could be seen inglandular cells in the breast and epididymis, cells in the tubules in kidney, decidual cells in the placenta, trophoblastic cells in the placenta, glandular cells in the prostate and seminal vesicle, adipocytes in mesenchymal tissue, fibroblasts in mesenchymal tissue and cells in the red pulp in spleen. We were unable to detect Wilm's Tumor 1 in other tissues. Disease states, inflammation, and other physiological changes can have a substantial impact on antibody staining patterns. These measurements were all taken in tissues deemed normal or from patients without known disease. Tissues from cancer patients, for instance, have their own distinct pattern of Wilm's Tumor 1 expression as measured by anti-Wilm's Tumor 1 antibody immunohistochemical staining. The average level of expression by tumor is summarized in the table below. The variability row represents patient to patient variability in IHC staining. enQuire Bio's product, Wilm's Tumor 1 (WT1) (Wilm's Tumor & Mesothelial Marker) MonoSpecific Antibody, is available for Research Use Only (RUO-Only). This antibody is guaranteed to work for a period of two years when properly stored.